Santa Fe High School had conducted active shooter drills, armed police officers patrolled the hallways and students went through a scare in February after a false report of a campus gunman. 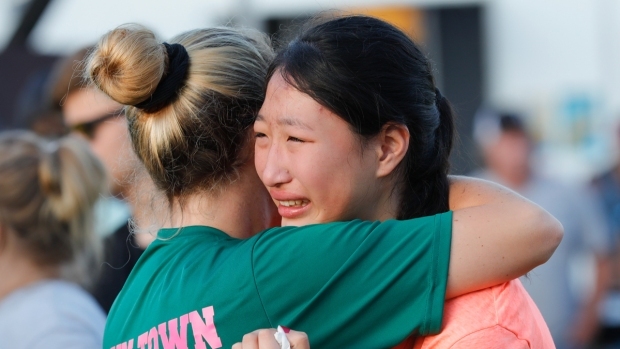 But in the aftermath of the deadliest public school shooting in Texas history, early witness accounts and recordings from emergency dispatch describe a near-30-minute nightmare as the real thing unfolded last week. While officials continued to keep many details of the deadly rampage close, Galveston County Sheriff Henry Trochesset responded Monday to criticism of the nearly half an hour it took officers to capture Dimitrios Pagourtzis, the 17-year-old student who authorities say opened fire on an art lab with a shotgun and .38 caliber handgun shortly after the first bell Friday morning. 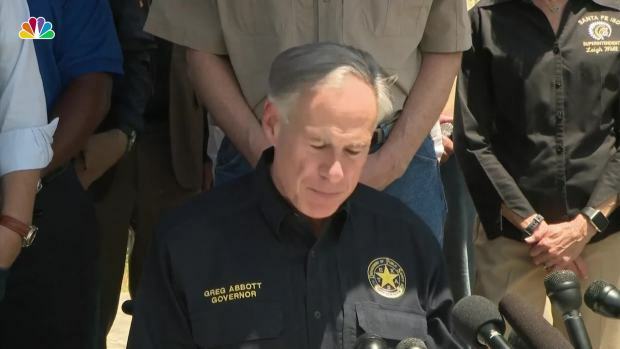 A school resource officer responded to the scene within four minutes of the shooting beginning and engaged with the shooter, Trochesset said at a Monday afternoon news conference. Other officers quickly arrived and were able contain the suspect, preventing him from going to other classrooms. The sheriff said that allowed the rest of Santa Fe High School to be evacuated safely. How much time elapsed from the moment gunfire erupted until the last victim was shot remains unclear. Trochesset said it was 25 minutes before Pagourtzis was taken into custody, though that included negotiations. Trochesset said he doesn't think any additional students were shot after officers confronted the shooter, but can't say for sure until autopsies are completed. Trochesset said 200 officers from law enforcement agencies throughout the region converged on the 1,400-student campus Friday. "When people were running from the gunfire, the officers that were continuing to arrive were going to it, and every door they opened, they weren't sure what was on the other side of it, but they opened those doors continuously, time after time, until that school was cleared," Trochesset said. "That's what you call a hero. They didn't run from it, they ran to it." He also revealed that a single negotiatior talked to the gunman. In the end, eight students and two teachers were killed and at least 10 others were injured. Pagourtzis remains in the Galveston County Jail without bond and under suicide watch, charged with capital murder. Trochesset said he doesn't believe any of the victims killed in the mass shooting were shot by law enforcement officers during the crossfire with Pagourtzis, but couldn't say for sure until autopsies are completed. Pagourtzis wasn't hit in the firefight with police. Officials have not yet released 911 tapes but on emergency dispatch recordings from Galveston County, captured by Broadcastify.com, a female voice is heard saying "more shots fired" about 10 minutes after authorities first received reports of gunfire. Five minutes later, a male voice says the suspect is "possibly going to be barricaded" with additional reports of shooting a few minutes after that. "He's actively shooting. He's in the art room. We've got, we've got shots fired right now. We need you all up here," a male voice says at what appears to be about 15 minutes after the shooting began. Galveston County Judge Mark Henry, the county's top administrator, said investigators were still working on the timeline and Tisa cautioned that emergency dispatch traffic doesn't always reflect real time. A "decent amount of cameras in the school" will help investigators piece together a timeline, Trochesset added. Zach Wofford, an 18-year-old senior, was across the hallway when the shooting began and said he heard gunfire that lasted 10 to 15 minutes from the art classroom. That's where Breanna Quintanilla, a 17-year-old junior, was when the attack began. She said Pagourtzis had aimed at her and missed but that the bullet ricocheted into her right leg. She recalled the voice she heard after the first sound of gunfire in the class: "If you all move, I'm going to shoot you all." One school resource officer that had been seriously wounded in the shooting was upgraded Monday from critical to stable condition after undergoing surgery to repair his badly damaged arm. Capt. Jim Dale of the Houston Police Department said Santa Fe school district police Officer John Barnes remains on a ventilator and had lost a lot of blood from his wound. School officials announced Monday that students won't return to classes until after Memorial Day — on Tuesday, May 29.